Elizabethtown, Ky. (September 10, 2018) – A pilot program from Connected Nation is now providing digital job and customer service training geared specifically for the unique needs of military spouses and veterans. A press conference was held last week in Elizabethtown to officially announce that Digital Works℠ (DW) classes were being offered near Fort Knox at Elizabethtown Community and Technical College. This one-of-a-kind job-creation program was developed specifically to meet the growing demand for online and digitally trained workers. 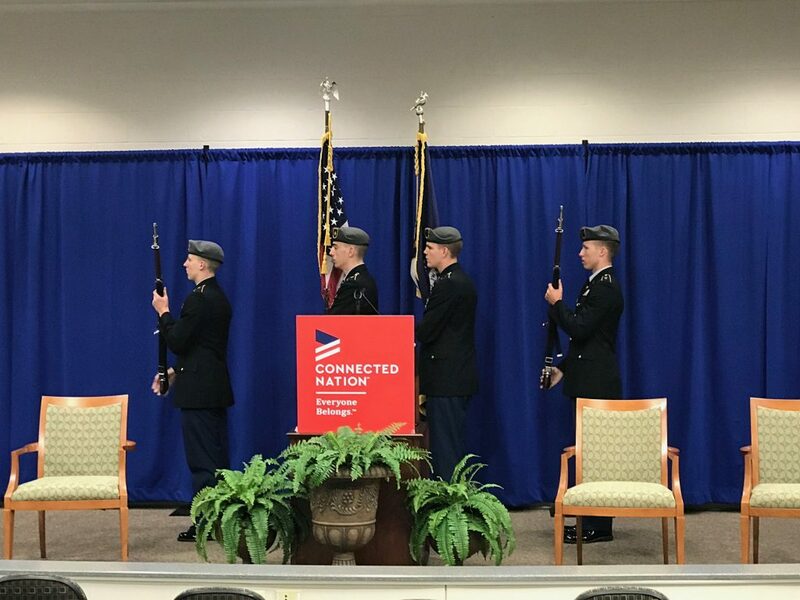 The event was attended by key stakeholders, supporters, and sponsors of the Digital Works program in Elizabethtown, including Col. (R) M. Blaine Hedges, Executive Director, KY Commission on Military Affairs; Brig. Gen. Benjamin F. Adams III, Commissioner, KY Dept. of Veterans Affairs; Hood Harris President, AT&T Kentucky, which funded the area program, and Dr. Juston Pate, President, Elizabethtown Community & Technical College. Nearly 900 graduates have already gone through the program in both rural and urban settings. It’s successful because it goes beyond training and job placement to long-term career guidance and mentorship while addressing a void in today’s workforce — the need for skilled workers to fill remote and telework positions. Digital Works℠ represents more than 70 regional, national, and global employers with incredible demand for remote workers. The program delivers customized training so that students learn the in-demand skills that companies are searching for in today’s modern workforce. The program’s staff also helps with job placement and provides support and ongoing training for dealing with the unique challenges and opportunities of digital jobs and telework. To sign up for the upcoming classes for military spouses and veterans, go to digitalworksjobs.com. Then, click on “Apply Today” and choose the “Elizabethtown, KY/Fort Knox area” option to learn about upcoming classes. Then, be sure to check your inbox for an email detailing the next steps. For more information, email us at info@connectednation.org.